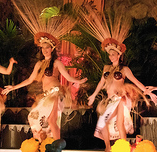 (2 nights stay Honolulu, 3 nights stay Hilo), Polynesian Cultural Center and dinner, Chinese/English Speaking Tour Guide. ※ 2 Days’ passengers fly back home today. ※ BIHH5A/B, BIHH6A/B tour's passengers join in tour. In the morning leave for the Akaka Falls and view the 150 meters long waterfalls & experience Hawaiian lash tropical forest. Visit Waipio valley, where the first King of Hawaii Kamehameha grew up. Next, we will have lunch in the beautiful town of Haimea, where you can enjoy grass fed beef from local pastures. We are going to the Temple Hawaii Kingdom facing ocean built with bare hands. And there is the chance to see whales (Dec. to Apr.). Last stop Hapuna Beach (White Beach), the world’s ten most beautiful beaches for ten consecutive years. It is also the largest natural white sand beach in the Hawaiian Islands. Drive thru Mauna Loa volcano, the world largest volcano on earth. Return to hotel in the evening, or transfer to airport. ※ 3 Days’ passengers fly back home today. 4 Days passengers deport for home- town. 6 Days passengers arrive in Honolulu. Meet with tour guide at bag- gage claim hall. Then drive to hotel. Free leisure time at Waikiki beach. 6/7 days tour morning fly to Maui “the Valley Island,” visit the famous ancient battlefield of the Great Kamehameha battlefield - Needle Valley , then along the coastal highway, lookout the Holy Land of snorkeling-- Molokini, then come to the classic Hawaiian whaling port -- Lahaina, the town that retains the breath of the eighteenth century, the harbor with pleasant scenery and the buildings have variety of different styles, then visit the whale Museum, tropical Botanical Garden,Kapalua Bay Villas. After an exciting day trip, pas- sengers will be transfered to the airport to Honolulu. * Maui tour: Flight must arrive before 9:00AM, Flight must depart after 6:00PM. 6 days passengers transfer to airport. 7 days passengers begin with tour of Waikiki Beach; enjoy the Panoramic View from Diamond Head lookout/Cra- ter-Hawaii’s most renowned landmark. During a breath-taking and beautiful 75 miles trip around the Island. we will visit Kahala, Haaona Blowhole, Makapuu Beach, Hawaiian homestead lands and the Nunanu Pali lookout. Free time in the morning, then transfer to the airport. 5N hotel, Polynesian Cultural Center ticket, Chinese / English speaking tour guide.